The head of the Coptic Orthodox Church has called on a Catholic charity to redouble its efforts to help Christians stay in the Middle East. 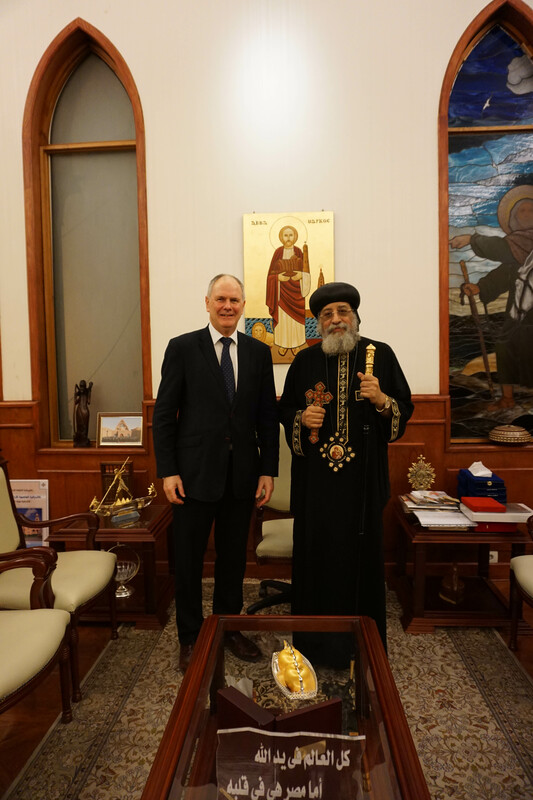 Coptic Orthodox Pope Tawadros II made the plea at a meeting with Neville Kyrke-Smith, national director of Aid to the Church in Need (UK). At the meeting in Cairo on Tuesday (20th March), Pope Tawadros said: “I would ask you please to support the presence of Christians in this land and in the Middle East. “Christians are a vital presence – and a buffer in the Middle East between Sunnis and Shi‘as. “Please do not help the Christians to leave but help them to stay. Aid to the Church in Need is supporting projects in Egypt including repair of churches and convents – particularly those destroyed by extremist violence in 2013 after the fall of President Morsi – assistance for youth work, and Mass stipends for priests. ACN is also helping Christians stay in Iraq by rebuilding towns and villages on the Nineveh Plains destroyed by extremist group Daesh (ISIS). At the meeting with Kyrke-Smith, Pope Tawadros said the attacks by Daesh and other extremist groups on Egypt’s Christians were intended to destroy the good relations between different groups within Egyptian society. “The attacks in recent years were not so much attacks against Christians, Muslims or security forces but attacks against national unity. Pope Tawadros also stressed the importance of building bridges not only with other Christians but with other faiths, stating that the visit of the Crown Prince of Saudi Arabia Mohammed bin Salman earlier this month was of “great significance”. He said the April 2017 meeting with Pope Francis was important for both Churches. Pope Tawadros stressed how welcome he had felt when he visited Rome in 2013 and first met Pope Francis. Kyrke-Smith also met with the Coptic Catholic Patriarch Ibrahim Sidrak who emphasized that there were signs of change for the better. Patriarch Sidrak said: “Recent developments including the visit of Mohammed bin Salman, the Crown Prince of Saudi Arabia, the Pope’s meeting with the Grand Imam of Al-Azhar and the visit of Pope Francis are important steps of hope for all Egyptians.